Greetings! Today marks the two week mark that I have lived without a bumpy femoral head and a labral tear in either hip for a VERY long time :) I do miss that extra bone....NOT! I can't believe how far I have come in two weeks. I feel a bit better every day. Very slight increases in strength and motion are what keeps this terribly long recovery bearable. The baby steps certainly count! I am still on crutches, but I can put more weight onto the operated side. I can take a couple of lurching steps, but have been instructed that I must not walk with a limp (both by the physiotherapist at the hospital and my own physiotherapist.) It is so easy to develop a motor pattern for a limp which makes it extremely difficult to fix. I can walk around the house with one crutch, but by the end of the day I am back on two, touch toe weight bearing, and quite sore. Today I had my third physiotherapy session. She said that I am progressing well; especially where I started a week ago. My quads and hamstrings are so darn tight. I tell them to relax, but they must be high strung or something because they are dead set on being tight. Stupid muscles! At physiotherapy I also received more exercises to do. As well, I got the clear to do work in the pool. Yay, I can cool down, get a tan, and do exercises all at the same time! I am pumped. I decided to do some ROM with my hip in the pool today. Man, I can't imagine how much work was done since that hip is sooooo stiff! Aw well, I'll get it loosened up quick enough. During my session with the physiotherapist, I had my quadriceps stimulated again. She kept saying how little my leg was. Although I am naturally thin, one shouldn't be able to feel the femur though the muscles, nor (almost) all the way around the tibia. This kind of grosses me out, but we are trying to electrically stimulate my muscles each time I go to prevent further atrophy before I can start consistently weight bear, and build up some strength. Until then, I live with a "little leg." 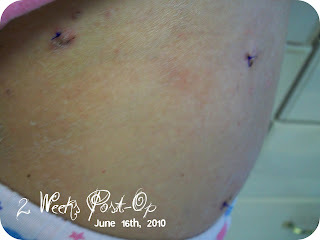 The incisions are great. And will be greater when the stitches decide that they want to fall off. I would appreciate it if they would hurry up because they catch on everything. Heck, they cut the physiotherapist's hand this morning; drew blood! I even trimmed them yesterday; they still are evil, evil things. 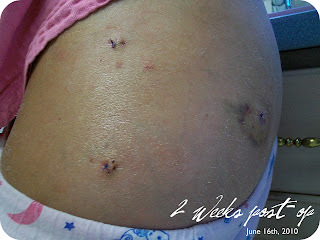 On the other hand, maybe I shouldn't curse the stitches, I might offend them and they could decide to stick around longer just to torture me. So, I love, LOVE, LOVE my stitches. Ha! Anywho, my bed is calling my name. Here's hoping I can make it through the night without too much pain; the past couple of days have not been the least bit fun lying awake in bed, as tight as a board waiting for things to settle down.